Despite Bill McKibben's change of heart, the evidence that climate change is not a hoax seems to be rising. Biman Mukerji and Diksha Sahni report from New Dehli for the Wall Street Journal, "Swaths of northern India are facing water shortages due to the late arrival of monsoon rains, deepening already acute power shortages and disrupting the sowing season of staple food crops at a time when India's economy is fragile." The "Father of Hybrid Rice" is somebody that Chinese students learn about in their English textbook during the first year in senior middle school (aka high school). He made dramatic predictions about the potential for increased grain outputs in a speech in Changchun on Thursday, but sizzling weather may interfere with this. In Changchun, we have received uncharacteristically large quantities of thunderstorms and the temperatures have hovered around 90F for the last few days. A drought in China has also impeded crop production. Arable land totaling 5.17 million hectares (12.8 million acres) in Henan, Anhui, Shandong, and Inner Mongolia is being affected by the dry spell. Furthermore, 4.28 million people and 4.85 million heads of livestock in Yunnan, Hubei, and Inner Mongolia are short of drinking water, Xinhua reported. The Chinese government called for a Level IV emergency response plan to deal with the drought in Hubei Province, where city and county governments have allocated $US 1.2 million (7.72 million RMB) to ease shortages of drinking water and food. The return of El Niño weather conditions could further parch China and the Korean Peninsula. The weather phenomenon, part of the El Niño Southern Oscillation (ENSO) weather cycle that includes La Niña, is caused by warmer than normal water temperatures in the equatorial Pacific. 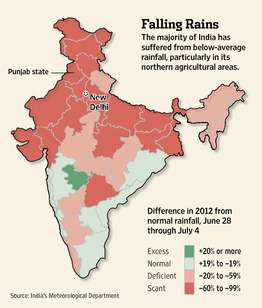 El Niño generally brings droughts to Asia and Australia, while dumping rain on North and South America. Phoebe Sedgman and Elizabeth Campbell report for Bloomberg, "Goldman Sachs Group Inc. says this may be the first time in five years that New Zealand, the world’s biggest dairy exporter, produces less milk, at a time when surging corn prices are raising costs for U.S. farmers.... The heat wave wilting corn in the US Midwest is raising feed costs for farmers and may curb milk yields." N.B. It is quite difficult to find English articles in China about weather patterns and recent monthly weather data. You are encouraged to leave your two cents. Copyright 2010. Watermark theme. Powered by Blogger.